Take full advantage of prepping ahead of time and make entertaining easy with these easy Individual Seven Layer Dips. I love to host parties, and we all know the fun starts with appetizers. But even a simple happy hour is not without its logistical challenges. 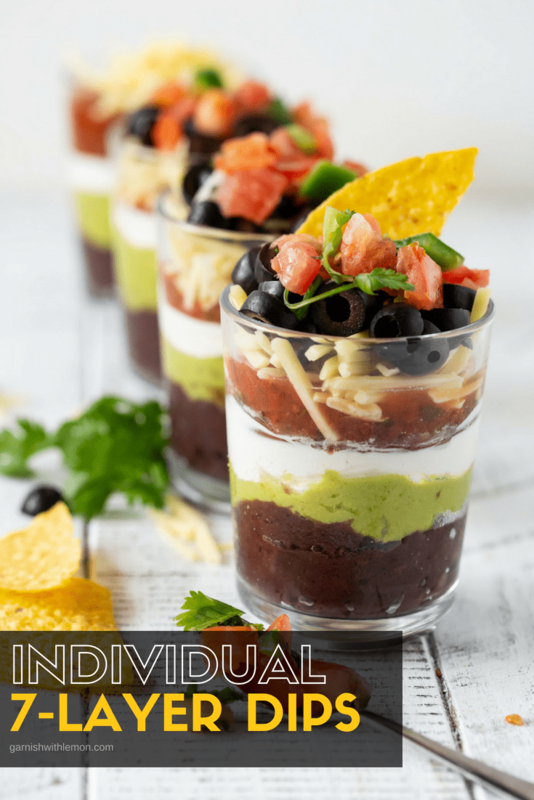 I always wonder how much food I need, so to take the guesswork out of portion sizes, I started with these make-ahead Individual Seven Layer Dips, and we were entertaining in style. These Individual Seven Layer Dips are my new go-to appetizer. What’s not to love about layers of black refried beans, guacamole, sour cream, pico, and cheese? Especially when it’s Kerrygold® Mild Cheddar Shredded Cheese. Their shreds are a great way to get the cheese flavor we love without the work of shredding ourselves. Can I make these Seven Layer Dips ahead of time? Yes! Just layer the ingredients and wrap them tightly in the refrigerator until serving. I made mine a full day before serving, and no one had a clue when happy hour rolled around. Anything that makes entertaining easy is a no-brainer in my book. Won’t the guacamole get brown if I make these Seven Layer Dips ahead of time? Nope. Because the guacamole is sandwiched between the beans and the sour cream, the air can’t hit it letting the guac keep its nice bright green color. 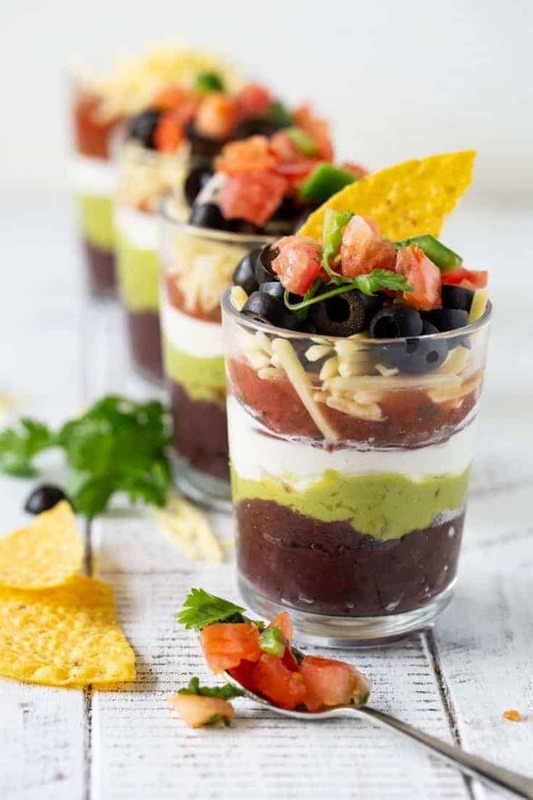 These Individual Seven Layer dips are easy to tailor to your guests’ tastes. Don’t care for one of the ingredients? Simply omit it and no one will be the wiser. The sky is the limit with these beauties. Make things even easier and use plastic glasses. You just got the prep work and dishes done in one fell swoop. Win-Win. Dips are a sure fire way to our hearts. Here are some more favorites. 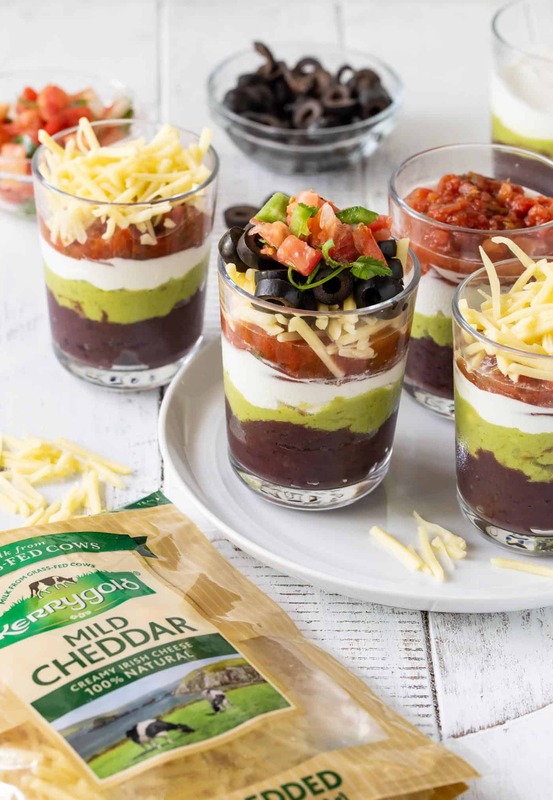 These Make-Ahead Individual Seven Layer Dips take the guesswork out of portion sizes making them perfect for entertaining. 1. Place 3 tablespoons of refried beans in the bottom of each glass and spread with a spoon. 2. Layer 2 tablespoons of guacamole on top and spread until smooth. 3. Carefully spoon in 2 tablespoons of sour cream on top of guacamole. 4. Spoon 2 tablespoons of salsa on top of sour cream and smooth with a spoon. 5. Add 2 tablespoons of shredded cheese on top of salsa. 6. Add 1 1/2 teaspoons of sliced black olives on top of cheese. 7. Finish with 2 tablespoons of Pico de Gallo. 8. Refrigerate until serving. Serve with tortilla chips. These can be made 24 hours in advance. Cover tightly and refrigerate.